Anyone know who Curt Flood was? I’ll give you a hint; he was the first free agent in Major League Baseball. Okay, that may not be altogether accurate, but close enough to talk about. In 1970, on January 16th (Today’s Date), he won an antitrust lawsuit against major league baseball paving the way for free agency. You may or may not like free agency in sports, you may not like having to read through the roster of your favorite team every year to determine who plays for them now or who moved on, but I assure you it is better than it used to be. In the old days, before Curt Flood, baseball players were required to play for the team that signed them into the league unless they were traded or retired. This meant if you signed a three year contract, at the end of the three years, if you wanted to still play, you’d have to sign a contract with the same team. 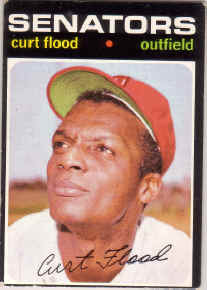 Curt Flood was traded by the Cardinals to the Phillies. Well, the Cardinals were coming off of a couple of World Series Titles (Lou Brock, Orlando Cepeda, Bob Gibson, Steve Carlton), but off of a tough loss that a lot of people pinned on Flood. The Phillies on the other hand were horrible, played in a horrible stadium, in front of horrible racist crowds. Sorry, Philly, but it’s the darkness of the sixties and seventies, deal with it. Flood wrote a nice letter to the commissioner of MLB pleading his case (I recently viewed the letter at a Cooperstown exhibit at the Museum of California in Oakland) , but the commissioner didn’t give him freedom, so he filed the lawsuit. He lost the lawsuit and went on to gain free agency by sitting out the 1971 season and then played for the Washington Senators coached by Ted Williams. When he arrived in the locker room there was a funeral wreath on his locker and he never played very well, at the time many players despised him, but now he is revered as a pioneer. He retired just 13 games into that season. His numbers before the dispute were on track for the Hall of Fame, but he never was inducted. It’s a shame that only the historic letter is in the hall that is so important to all professional athletes in today’s era.